Environmentalism denotes a social movement that seeks to influence the political process by lobbying, activism, and education in order to protect natural resources and ecosystems. An environmentalist is a person who may speak out about our natural environment and the sustainable management of its resources through changes in public policy or individual behaviour. This may include supporting practices such as informed consumption, conservation initiatives, investment in renewable resources, improved efficiencies in the materials economy, transitioning to new accounting paradigms such as Ecological economics, renewing and revitalizing our connections with non-human life or even opting to have one less child to reduce consumption and pressure on resources. In various ways (for example, grassroots activism and protests), environmentalists and environmental organisations seek to give the natural world a stronger voice in human affairs. In general terms, environmentalists advocate the sustainable management of resources, and the protection (and restoration, when necessary) of the natural environment through changes in public policy and individual behaviour. In its recognition of humanity as a participant in ecosystems, the movement is centered around ecology, health, and human rights. A concern for environmental protection has recurred in diverse forms, in different parts of the world, throughout history. The earliest ideas of environment protectionism can be traced in Jainism, which was revived by Mahavira in 6th century BC in ancient India. Jainism offers a view that may seem readily compatible with core values associated with environmental activism, i.e., protection of life by nonviolence; which could form the basis of strong ecological ethos thus adding its voice to global calls for protection of environment. In Europe, King Edward I of England banned the burning of sea-coal by proclamation in London in 1272, after its smoke had become a problem. The fuel was so common in England that this earliest of names for it was acquired because it could be carted away from some shores by the wheelbarrow. Earlier in the Middle East, the Caliph Abu Bakr in the 630s commanded his army to "Bring no harm to the trees, nor burn them with fire," and "Slay not any of the enemy's flock, save for your food." Arabic medical treatises during the 9th to 13th centuries dealing with environmentalism and environmental science, including pollution, were written by Al-Kindi, Qusta ibn Luqa, Al-Razi, Ibn Al-Jazzar, al-Tamimi, al-Masihi, Avicenna, Ali ibn Ridwan, Ibn Jumay, Isaac Israeli ben Solomon, Abd-el-latif, Ibn al-Quff, and Ibn al-Nafis. Their works covered a number of subjects related to pollution, such as air pollution, water pollution, soil contamination, municipal solid waste mishandling, and environmental impact assessments of certain localities. At the advent of steam and electricity the muse of history holds her nose and shuts her eyes (H. G. Wells 1918). In industrial cities local experts and reformers, especially after 1890, took the lead in identifying environmental degradation and pollution, and initiating grass-roots movements to demand and achieve reforms. Typically the highest priority went to water and air pollution. The Coal Smoke Abatement Society was formed in 1898 making it one of the oldest environmental NGOs. It was founded by artist Sir William Blake Richmond, frustrated with the pall cast by coal smoke. Although there were earlier pieces of legislation, the Public Health Act 1875 required all furnaces and fireplaces to consume their own smoke. It also provided for sanctions against factories that emitted large amounts of black smoke. The provisions of this law were extended in 1926 with the Smoke Abatement Act to include other emissions, such as soot, ash and gritty particles and to empower local authorities to impose their own regulations. During the Spanish Revolution, anarchist controlled territories undertook several environmental reforms which were possibly the largest in the world at the time. Daniel Guerin notes that anarchist territories would diversify crops, extend irrigation, initiate reforestation, start tree nurseries and helped establish nudist colonies. Once there was a link discovered between air pollution and tuberculosis, the CNT shut down several metal factories. It was, however, only under the impetus of the Great Smog of 1952 in London, which almost brought the city to a standstill and may have caused upward of 6,000 deaths that the Clean Air Act 1956 was passed and airborne pollution in the city was first tackled. Financial incentives were offered to householders to replace open coal fires with alternatives (such as installing gas fires), or for those who preferred, to burn coke instead (a byproduct of town gas production) which produces minimal smoke. 'Smoke control areas' were introduced in some towns and cities where only smokeless fuels could be burnt and power stations were relocated away from cities. The act formed an important impetus to modern environmentalism, and caused a rethinking of the dangers of environmental degradation to people's quality of life. The late 19th century also saw the passage of the first wildlife conservation laws. The zoologist Alfred Newton published a series of investigations into the Desirability of establishing a 'Close-time' for the preservation of indigenous animals between 1872 and 1903. His advocacy for legislation to protect animals from hunting during the mating season led to the formation of the Royal Society for the Protection of Birds and influenced the passage of the Sea Birds Preservation Act in 1869 as the first nature protection law in the world. Early interest in the environment was a feature of the Romantic movement in the early 19th century. The poet William Wordsworth travelled extensively in the Lake District and wrote that it is a "sort of national property in which every man has a right and interest who has an eye to perceive and a heart to enjoy". Systematic efforts on behalf of the environment only began in the late 19th century; it grew out of the amenity movement in Britain in the 1870s, which was a reaction to industrialisation, the growth of cities, and worsening air and water pollution. Starting with the formation of the Commons Preservation Society in 1865, the movement championed rural preservation against the encroachments of industrialisation. Robert Hunter, solicitor for the society, worked with Hardwicke Rawnsley, Octavia Hill, and John Ruskin to lead a successful campaign to prevent the construction of railways to carry slate from the quarries, which would have ruined the unspoilt valleys of Newlands and Ennerdale. This success led to the formation of the Lake District Defence Society (later to become The Friends of the Lake District). Peter Kropotkin wrote about ecology in economics, agricultural science, conservation, ethology, criminology, urban planning, geography, geology and biology. He observed in Swiss and Siberian glaciers that they had been slowly melting since the dawn of the industrial revolution, possibly making him one of the first predictors for climate change. He also observed the damage done from deforestation and hunting. Kropotkin's writings would become influential in the 1970s and became a major inspiration for the intentional community movement as well as his ideas becoming the basis for the theory of social ecology. In 1893 Hill, Hunter and Rawnsley agreed to set up a national body to coordinate environmental conservation efforts across the country; the "National Trust for Places of Historic Interest or Natural Beauty" was formally inaugurated in 1894. The organisation obtained secure footing through the 1907 National Trust Bill, which gave the trust the status of a statutory corporation. and the bill was passed in August 1907. An early "Back-to-Nature" movement, which anticipated the romantic ideal of modern environmentalism, was advocated by intellectuals such as John Ruskin, William Morris, George Bernard Shaw and Edward Carpenter, who were all against consumerism, pollution and other activities that were harmful to the natural world. The movement was a reaction to the urban conditions of the industrial towns, where sanitation was awful, pollution levels intolerable and housing terribly cramped. Idealists championed the rural life as a mythical utopia and advocated a return to it. John Ruskin argued that people should return to a small piece of English ground, beautiful, peaceful, and fruitful. We will have no steam engines upon it . . . we will have plenty of flowers and vegetables . . . we will have some music and poetry; the children will learn to dance to it and sing it. Practical ventures in the establishment of small cooperative farms were even attempted and old rural traditions, without the "taint of manufacture or the canker of artificiality", were enthusiastically revived, including the Morris dance and the maypole. These ideas also inspired various environmental groups in the UK, such as the Royal Society for the Protection of Birds, established in 1889 by Emily Williamson as a protest group to campaign for greater protection for the indigenous birds of the island. The Society attracted growing support from the suburban middle-classes as well as support from many other influential figures, such as the ornithologist Professor Alfred Newton. By 1900, public support for the organisation had grown, and it had over 25,000 members. The Garden city movement incorporated many environmental concerns into its urban planning manifesto; the Socialist League and The Clarion movement also began to advocate measures of nature conservation. The movement in the United States began in the late 19th century, out of concerns for protecting the natural resources of the West, with individuals such as John Muir and Henry David Thoreau making key philosophical contributions. Thoreau was interested in peoples' relationship with nature and studied this by living close to nature in a simple life. He published his experiences in the book Walden, which argues that people should become intimately close with nature. Muir came to believe in nature's inherent right, especially after spending time hiking in Yosemite Valley and studying both the ecology and geology. He successfully lobbied congress to form Yosemite National Park and went on to set up the Sierra Club in 1892. The conservationist principles as well as the belief in an inherent right of nature were to become the bedrock of modern environmentalism. In the 20th century, environmental ideas continued to grow in popularity and recognition. Efforts were starting to be made to save some wildlife, particularly the American bison. The death of the last passenger pigeon as well as the endangerment of the American bison helped to focus the minds of conservationists and popularise their concerns. In 1916 the National Park Service was founded by US President Woodrow Wilson. The Forestry Commission was set up in 1919 in Britain to increase the amount of woodland in Britain by buying land for afforestation and reforestation. The commission was also tasked with promoting forestry and the production of timber for trade. During the 1920s the Commission focused on acquiring land to begin planting out new forests; much of the land was previously used for agricultural purposes. By 1939 the Forestry Commission was the largest landowner in Britain. During the 1930s the Nazis had elements that were supportive of animal rights, zoos and wildlife, and took several measures to ensure their protection. In 1933 the government created a stringent animal-protection law and in 1934, Das Reichsjagdgesetz (The Reich Hunting Law) was enacted which limited hunting. Several Nazis were environmentalists (notably Rudolf Hess), and species protection and animal welfare were significant issues in the regime. In 1935, the regime enacted the "Reich Nature Protection Act" (Reichsnaturschutzgesetz). The concept of the Dauerwald (best translated as the "perpetual forest") which included concepts such as forest management and protection was promoted and efforts were also made to curb air pollution. In 1949, A Sand County Almanac by Aldo Leopold was published. It explained Leopold's belief that humankind should have moral respect for the environment and that it is unethical to harm it. The book is sometimes called the most influential book on conservation. Throughout the 1950s, 1960s, 1970s and beyond, photography was used to enhance public awareness of the need for protecting land and recruiting members to environmental organisations. David Brower, Ansel Adams and Nancy Newhall created the Sierra Club Exhibit Format Series, which helped raise public environmental awareness and brought a rapidly increasing flood of new members to the Sierra Club and to the environmental movement in general. "This Is Dinosaur" edited by Wallace Stegner with photographs by Martin Litton and Philip Hyde prevented the building of dams within Dinosaur National Monument by becoming part of a new kind of activism called environmentalism that combined the conservationist ideals of Thoreau, Leopold and Muir with hard-hitting advertising, lobbying, book distribution, letter writing campaigns, and more. The powerful use of photography in addition to the written word for conservation dated back to the creation of Yosemite National Park, when photographs persuaded Abraham Lincoln to preserve the beautiful glacier carved landscape for all time. The Sierra Club Exhibit Format Series galvanised public opposition to building dams in the Grand Canyon and protected many other national treasures. The Sierra Club often led a coalition of many environmental groups including the Wilderness Society and many others. After a focus on preserving wilderness in the 1950s and 1960s, the Sierra Club and other groups broadened their focus to include such issues as air and water pollution, population concern, and curbing the exploitation of natural resources. In 1962, Silent Spring by American biologist Rachel Carson was published. The book cataloged the environmental impacts of the indiscriminate spraying of DDT in the US and questioned the logic of releasing large amounts of chemicals into the environment without fully understanding their effects on human health and ecology. The book suggested that DDT and other pesticides may cause cancer and that their agricultural use was a threat to wildlife, particularly birds. The resulting public concern led to the creation of the United States Environmental Protection Agency in 1970 which subsequently banned the agricultural use of DDT in the US in 1972. The limited use of DDT in disease vector control continues to this day in certain parts of the world and remains controversial. The book's legacy was to produce a far greater awareness of environmental issues and interest into how people affect the environment. With this new interest in environment came interest in problems such as air pollution and petroleum spills, and environmental interest grew. New pressure groups formed, notably Greenpeace and Friends of the Earth (US), as well as notable local organisations such as the Wyoming Outdoor Council, which was founded in 1967. In the 1970s, the environmental movement gained rapid speed around the world as a productive outgrowth of the counterculture movement. The world's first political parties to campaign on a predominantly environmental platform were the United Tasmania Group Tasmania, Australia and the Values Party of New Zealand. The first green party in Europe was the Popular Movement for the Environment, founded in 1972 in the Swiss canton of Neuchâtel. The first national green party in Europe was PEOPLE, founded in Britain in February 1973, which eventually turned into the Ecology Party, and then the Green Party. Protection of the environment also became important in the developing world; the Chipko movement was formed in India under the influence of Mhatmas Gandhi and they set up peaceful resistance to deforestation by literally hugging trees (leading to the term "tree huggers"). Their peaceful methods of protest and slogan "ecology is permanent economy" were very influential. Another milestone in the movement was the creation of Earth Day. Earth Day was first observed in San Francisco and other cities on March 21, 1970, the first day of spring. It was created to give awareness to environmental issues. On March 21, 1971, United Nations Secretary-General U Thant spoke of a spaceship Earth on Earth Day, hereby referring to the ecosystem services the earth supplies to us, and hence our obligation to protect it (and with it, ourselves). 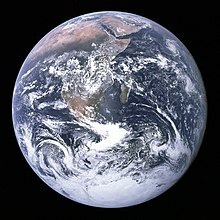 Earth Day is now coordinated globally by the Earth Day Network, and is celebrated in more than 175 countries every year. The UN's first major conference on international environmental issues, the United Nations Conference on the Human Environment (also known as the Stockholm Conference), was held on June 5–16, 1972. It marked a turning point in the development of international environmental politics. By the mid-1970s, many felt that people were on the edge of environmental catastrophe. The Back-to-the-land movement started to form and ideas of environmental ethics joined with anti-Vietnam War sentiments and other political issues. These individuals lived outside normal society and started to take on some of the more radical environmental theories such as deep ecology. Around this time more mainstream environmentalism was starting to show force with the signing of the Endangered Species Act in 1973 and the formation of CITES in 1975. Significant amendments were also enacted to the United States Clean Air Act and Clean Water Act. In 1979, James Lovelock, a British scientist, published Gaia: A new look at life on Earth, which put forth the Gaia hypothesis; it proposes that life on earth can be understood as a single organism. This became an important part of the Deep Green ideology. Throughout the rest of the history of environmentalism there has been debate and argument between more radical followers of this Deep Green ideology and more mainstream environmentalists. Environmentalism continues to evolve to face up to new issues such as global warming, overpopulation and genetic engineering. Research demonstrates a precipitous decline in the US public's interest in 19 different areas of environmental concern. Americans are less likely be actively participating in an environmental movement or organisation and more likely to identify as "unsympathetic" to an environmental movement than in 2000. This is likely a lingering factor of the Great Recession in 2008. Since 2005, the percentage of Americans agreeing that the environment should be given priority over economic growth has dropped 10 points, in contrast, those feeling that growth should be given priority "even if the environment suffers to some extent" has risen 12 percent. These numbers point to the growing complexity of environmentalism and its relationship to economics. Tree sitting is a form of activism in which the protester sits in a tree in an attempt to stop the removal of a tree or to impede the demolition of an area with the longest and most famous tree-sitter being Julia Butterfly Hill, who spent 738 days in a California Redwood, saving a three-acre tract of forest. Sit-in is a form of activism where one or any number of people occupy a place as a form of protest. The tactic can be used to encourage social change, such as the Greensboro sit-ins, a series of protests in 1960 to stop racial segregation, but can also be used in ecoactivism, as in the Dakota Access Pipeline Protest. Before the Syrian Civil War, Rojava had been ecologically damaged by monoculture, oil extraction, damming of rivers, deforestation, drought, topsoil loss and general pollution. The DFNS launched a campaign titled 'Make Rojava Green Again' (a parody of Make America Great Again) which is attempting to provide renewable energy to communities (especially solar energy), reforestation, protecting water sources, planting gardens, promoting urban agriculture, creating wildlife reserves, water recycling, beekeeping, expanding public transportation and promoting environmental awareness within their communities. The Rebel Zapatista Autonomous Municipalities are firmly environmentalist and have stopped the extraction of oil, uranium, timber and metal from the Lacandon Jungle and stopped the use of pesticides and chemical fertilisers in farming. The CIPO-RFM has engaged in sabotage and direct action against wind farms, shrimp farms, eucalyptus plantations and the timber industry. They have also set up corn and coffee worker cooperatives and built schools and hospitals to help the local populations. They have also created a network of autonomous community radio stations to educate people about dangers to the environment and inform the surrounding communities about new industrial projects that would destroy more land. In 2001, the CIPO-RFM defeated the construction of a highway that was part of Plan Puebla Panama. The environmental movement (a term that sometimes includes the conservation and green movements) is a diverse scientific, social, and political movement. Though the movement is represented by a range of organisations, because of the inclusion of environmentalism in the classroom curriculum, the environmental movement has a younger demographic than is common in other social movements (see green seniors). Environmentalism as a movement covers broad areas of institutional oppression, including for example: consumption of ecosystems and natural resources into waste, dumping waste into disadvantaged communities, air pollution, water pollution, weak infrastructure, exposure of organic life to toxins, mono-culture, anti-polythene drive (jhola movement) and various other focuses. Because of these divisions, the environmental movement can be categorized into these primary focuses: environmental science, environmental activism, environmental advocacy, and environmental justice. Free market environmentalism is a theory that argues that the free market, property rights, and tort law provide the best tools to preserve the health and sustainability of the environment. It considers environmental stewardship to be natural, as well as the expulsion of polluters and other aggressors through individual and class action. Evangelical environmentalism is an environmental movement in the United States of America in which some Evangelicals have emphasized biblical mandates concerning humanity's role as steward and subsequent responsibility for the care taking of Creation. While the movement has focused on different environmental issues, it is best known for its focus of addressing climate action from a biblically grounded theological perspective. This movement is controversial among some non-Christian environmentalists due to its rooting in a specific religion. Environmental preservation in the United States and other parts of the world, including Australia, is viewed as the setting aside of natural resources to prevent damage caused by contact with humans or by certain human activities, such as logging, mining, hunting, and fishing, often to replace them with new human activities such as tourism and recreation. Regulations and laws may be enacted for the preservation of natural resources. Environmental organisations can be global, regional, national or local; they can be government-run or private (NGO). Environmentalist activity exists in almost every country. Moreover, groups dedicated to community development and social justice also focus on environmental concerns. Some US environmental organisations, among them the Natural Resources Defense Council and the Environmental Defense Fund, specialise in bringing lawsuits (a tactic seen as particularly useful in that country). Other groups, such as the US-based National Wildlife Federation, the Nature Conservancy, and The Wilderness Society, and global groups like the World Wide Fund for Nature and Friends of the Earth, disseminate information, participate in public hearings, lobby, stage demonstrations, and may purchase land for preservation. Statewide nonprofit organisations such as the Wyoming Outdoor Council often collaborate with these national organisations and employ similar strategies. Smaller groups, including Wildlife Conservation International, conduct research on endangered species and ecosystems. More radical organisations, such as Greenpeace, Earth First!, and the Earth Liberation Front, have more directly opposed actions they regard as environmentally harmful. While Greenpeace is devoted to nonviolent confrontation as a means of bearing witness to environmental wrongs and bringing issues into the public realm for debate, the underground Earth Liberation Front engages in the clandestine destruction of property, the release of caged or penned animals, and other criminal acts. Such tactics are regarded as unusual within the movement, however. On an international level, concern for the environment was the subject of a United Nations Conference on the Human Environment in Stockholm in 1972, attended by 114 nations. Out of this meeting developed UNEP (United Nations Environment Programme) and the follow-up United Nations Conference on Environment and Development in 1992. Other international organisations in support of environmental policies development include the Commission for Environmental Cooperation (as part of NAFTA), the European Environment Agency (EEA), and the Intergovernmental Panel on Climate Change (IPCC). Every year, more than 100 environmental activists are murdered throughout the world. Most recent deaths are in Brazil, where activists combat logging in the Amazon rainforest. 116 environmental activists were assassinated in 2014, and 185 in 2015. (This represents more than two environmentalists assassinated every week in 2014 and three every week in 2015.) More than 200 environmental activists were assassinated worldwide between 2016 and early 2018. The popular media have been used to convey conservation messages in the U.S. For instance, the U.S. Forest Service created Smokey the Bear in 1944; he appeared in countless posters, radio and television programs, movies, press releases, and other guises to warn about forest fires. The comic strip Mark Trail, by environmentalist Ed Dodd, began in 1946; it still appears weekly in 175 newspapers. Another example is the children's animated show Captain Planet and the Planeteers, created by Ted Turner and Barbara Pyle in 1989 to inform children about environmental issues. The show aired for six seasons and 113 episodes, in 100 countries worldwide from 1990 to 1996. In 1974, Spokane, Washington, became the smallest city ever to host a World's Fair. From Saturday, May 4, to Sunday, November 3, 1974, Spokane hosted Expo 74, the first world's fair to focus on the environment. The theme of Expo 74 was "Celebrating Tomorrow's Fresh New Environment." FernGully: The Last Rainforest is an animated motion picture released in 1992, which focuses exclusively on the environment. The movie is based on a book under the same title by Diana Young. In 1998, a sequel, FernGully 2: The Magical Rescue, was introduced. Miss Earth is one of the Big Four international beauty pageants. (The other three are Miss Universe, Miss International, and Miss World.) Of these three, Miss Earth is the only beauty pageant that promotes "environmental awareness." The reigning titleholders dedicate their year to promote specific projects and often address issues concerning the environment and other global issues through school tours, tree planting activities, street campaigns, coastal clean ups, speaking engagements, shopping mall tours, media guesting, environmental fair, storytelling programs, eco-fashion shows, and other environmental activities. The Miss Earth winner is the spokesperson for the Miss Earth Foundation, the United Nations Environment Programme (UNEP) and other environmental organizations. The Miss Earth Foundation also works with the environmental departments and ministries of participating countries, various private sectors and corporations, as well as Greenpeace and the World Wildlife Foundation (WWF). Another area of environmentalism is to use art to raise awareness about misuse of the environment. One example is trashion, using trash to create clothes, jewelry, and other objects for the home. Marina DeBris is one trashion artist, who focuses on ocean and beach trash to design clothes and for fund raising, education. Many environmentalists believe that human interference with 'nature' should be restricted or minimised as a matter of urgency (for the sake of life, or the planet, or just for the benefit of the human species), whereas environmental skeptics and anti-environmentalists do not believe that there is such a need. One can also regard oneself as an environmentalist and believe that human 'interference' with 'nature' should be increased. Nevertheless, there is a risk that the shift from emotional environmentalism into the technical management of natural resources and hazards could decrease the touch of humans with nature, leading to less concern with environment preservation. ^ "Environmentalism – Definition and More from the Free Merriam-Webster Dictionary". Merriam-webster.com. 13 August 2010. Retrieved 20 June 2012. ^ Cat Lincoln (Spring 2009). "Light, Dark and Bright Green Environmentalism". Green Daily. Archived from the original on 25 April 2009. Retrieved 2 November 2009. ^ Rowell, Andrew (1996). Green Backlash. Routledge. ISBN 978-0-415-12828-5. ^ "Lord Mahavir was a great environmentalist". Times of India. ^ Long, Jeffery D. (2013). Jainism: An Introduction. I.B.Tauris. ISBN 978-0-85773-656-7 – via Google Books. ^ "Jainism Introduction". fore.yale.edu. Yale Forum on Religion and Ecology. ^ David Urbinato (Summer 1994). "London's Historic 'Pea-Soupers'". U.S. Environmental Protection Agency. Archived from the original on 2 October 2006. Retrieved 2006-08-02. ^ "Deadly Smog". PBS. 17 January 2003. Retrieved 2 August 2006. ^ In the Fourth Year: Anticipations of a World Peace, (London: Chatto & Windus), p. 100. ^ "London's Great Smog, 60 Years On". 10 December 2012. Retrieved 17 December 2012. ^ G. Baeyens; M. L. Martinez (2007). Coastal Dunes: Ecology and Conservation. Springer. p. 282. ^ Makel, Jo (2 February 2011). "Protecting seabirds at Bempton Cliffs". BBC News. ^ "Nature conservation in Britain, ca. 1870–1945". Archived from the original on 22 January 2013. Retrieved 2012-12-17. ^ Purchase, Graham (4 December 2013). "Green Flame: Kropotkin and the Birth of Ecology". zabalazabooks.net. ^ Gould, Peter C. (1988). Early Green Politics, Brighton, Harvester Press, pp. 15–19, and Wall, Derek, (1994) Green History: A Reader. London, Routledge, pp. 9–14. ^ Jan Marsh (1982). Back to the Land: The Pastoral Impulse in England, 1880–1914. Quartet Books. ISBN 978-0-7043-2276-9. ^ "'Back to nature' movement nothing new – dates back to 1880". Christian Science Monitor. 15 December 1983. Retrieved 17 December 2012. ^ "History of the RSPB". RSPB. Retrieved 19 February 2007. ^ Gould, (1988) pp. 16, 23–24, 36–38, 84–86. ^ "Forestry Commission – a brief history" (PDF). Woodland Trust. Retrieved 11 April 2012. ^ Sylvie Nail (2008). Forest Policies and Social Change in England. Springer. p. 332. ISBN 978-1-4020-8364-8. ^ Thomas R. DeGregori (2002). Bountiful Harvest: Technology, Food Safety, and the Environment. Cato Institute. p. 153. ISBN 978-1-930865-31-0. ^ a b Martin Kitchen (2006). A History of Modern Germany, 1800-2000. Blackwell Publishing. p. 278. ISBN 978-1-4051-0040-3. ^ "kaltio.fi". Retrieved 15 August 2007. ^ Dann, Christine. "The development of the first two Green parties New Zealand and Tasmania". From Earth's last islands. The global origins of Green politics. Global Greens. Archived from the original on 15 May 2011. Retrieved 4 August 2011. ^ "Resource temporarily unavailable". Earthday.net. Retrieved 22 April 2011. ^ "What Is Earth Day?". Chemistry.about.com. 15 April 2012. Retrieved 20 June 2012. ^ Clean Air Act Extension of 1970, 84 Stat. 1676, Pub.L. 91–604, 1970-12-31. ^ Pub.L. 95-217 Archived 29 February 2012 at the Wayback Machine, December 27, 1977. ^ McCallum, M.L. & G.W. Bury (2013). "Google search patterns suggest declining interest in the environment". Biodiversity and Conservation. 22 (6): 1355–1367. doi:10.1007/s10531-013-0476-6. ^ a b "Environment | Gallup Historical Trends". Gallup.com. Retrieved 15 May 2013. ^ Fountain, Henry (18 June 2006). "Rising Above the Environmental Debate". New York Times. ^ Mele, Christopher (2016). "New York Times". Veterans To Serve as 'Human Shields' for Dakota Pipeline Protestors. ^ "Building Autonomy Through Ecology in Rojava". unicornriot.ninja. 28 February 2018. ^ Gobierno Autónomo I: Cuaderno de texto de primer grado del curso de “La Libertad según l@s Zapatistas”, 19. ^ Denham, Diana (2008). Teaching Rebellion: Stories from the Grassroots Mobilisation in Oaxaca. ^ Craig Kridel (2010). Encyclopedia of Curriculum Studies. Sage Publications, Inc. p. 341. ISBN 978-1-4129-5883-7. Retrieved 16 April 2010. ^ Jennifer Sinsel (15 April 2010). "Earth Day Activities". Lesson Planet. Retrieved 16 April 2010. ^ "American Environmental Justice Movement". www.iep.utm.edu. Internet Encyclopedia of Philosophy. Retrieved 15 April 2018. ^ Cunningham, William P.; et al. (1998). Environmental encyclopedia. Gale Research. ISBN 978-0-8103-9314-1. ^ "Leonardo DiCaprio". World Wildlife Fund. Retrieved 31 January 2016. ^ Holmes, Oliver (20 June 2016). "Environmental activist murders set record as 2015 became deadliest year". the Guardian. Retrieved 15 April 2018. ^ Ulmanu, Monica; Evans, Alan; Brown, Georgia (May 2018). "37 environmental defenders have been killed so far in 2018". The Guardian. Retrieved 26 May 2018. ^ "Map: 116 environmental activists were killed in just one year". Grist.org. 5 March 2016. Retrieved 25 September 2016. ^ Holmes, Oliver; correspondent, South-east Asia (20 June 2016). "Environmental activist murders set record as 2015 became deadliest year". The Guardian. Retrieved 25 September 2016. ^ Stout, David. "Environmental Activists Killed in Record Numbers in 2014". Time.com. Retrieved 25 September 2016. ^ "Killings of land and environmental defenders in 2015 | Global Witness". Global Witness. Retrieved 1 April 2017. ^ "Cambodian forest defenders killed after confronting illegal loggers". The Guardian. 31 January 2018. Retrieved 2 February 2018. ^ "Barbara Pyle, with Ted Turner created the animated action series Captain Planet and the Planeteers". www.barbarapyle.com. Retrieved 15 April 2018. ^ "'Washed Up' Art Exhibition Raises Awareness of Plastic Pollution". Wilson College. 4 April 2016. Retrieved 2 October 2017. ^ "Unmasking Pollution with Climate Art". UN Climate Change: Climate Action. United Nations Framework Convention on Climate Change. Retrieved 2 October 2017. ^ Cerini, Marianna (7 December 2016). "How limited edition sneakers designed by Kanye West are helping people breathe in China". CNN. CNN. Retrieved 2 October 2017. ^ Huesemann, Michael H., and Joyce A. Huesemann (2011). Technofix: Why Technology Won't Save Us or the Environment, New Society Publishers, Gabriola Island, British Columbia ISBN 0-86571-704-4, 464 pp. ^ Bakari, Mohamed El-Kamel. "Globalization and Sustainable Development: False Twins?." New Global Studies 7.3: 23–56. ^ Neil Paul Cummins "An Evolutionary Perspective on the Relationship Between Humans and Their Surroundings: Geoengineering, the Purpose of Life & the Nature of the Universe", Cranmore Publications, 2012. ^ "Vasconcelos, Vitor Vieira "The Environment Professional and the Touch with Nature." Qualit@s, v 1, pp. 1–10, 2011". Pt.scribd.com. 28 April 2013. Retrieved 15 May 2013. Daynes, Byron W., and Glen Sussman, eds. White House Politics and the Environment: Franklin D. Roosevelt to George W. Bush (Texas A&M University Press; 2010) 300 pages; evaluates how 12 presidents helped or hindered the cause of environmental protection. Johnson, Erik W., and Scott Frickel, (2011). "Ecological Threat and the Founding of U.S. National Environmental Movement Organizations, 1962–1998," Social Problems 58 (Aug. 2011), 305–29. Martell, Luke. "Ecology and Society: An Introduction". Polity Press, 1994. Lear, Linda (1997). Rachel Carson: Witness for Nature. New York: Henry Holt and Company. ISBN 978-0-8050-3428-8. World Bank, 2003, "Sustainable Development in a Dynamic World: Transforming Institutions, Growth, and Quality of Life", World Development Report 2003, International Bank for Reconstruction and Development and Oxford University Press. Wikimedia Commons has media related to Environmentalism. This page was last edited on 19 April 2019, at 05:39 (UTC).